From web GIS to apps and more, here are the top five conference takeaways that show how GIS shapes national government. In July, more than 14,000 GIS enthusiasts traveled to San Diego, California, for the Esri User Conference (Esri UC). From the moment Esri president Jack Dangermond took the stage at the Plenary Session the focus was clear—people are applying geography to create smarter communities, smarter organizations, and smarter nations. There were so many exciting sessions, workshops, networking events, and exhibits. To give you a look at the most important news, we’ve narrowed down the top five things you should know. Here’s what’s trending in GIS. Organizations use web GIS to drive efficiency and connectivity like never before. GIS-based portals are more than websites; they are hubs people depend on to do their work every day. The integrated ArcGIS platform transforms how national government staff make use of the web to map, analyze, manage, and communicate critical data. Innovative public-facing portals go a long way in connecting national governments with citizens. ArcGIS Open Data portals, for example, empower citizens to find the data they need to drive research, business ventures, and other important initiatives. 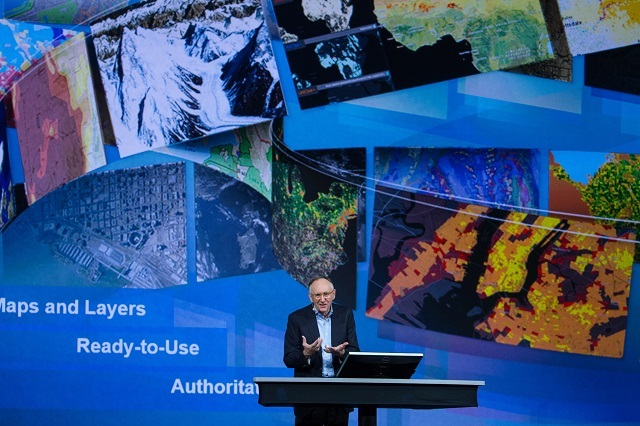 Esri president Jack Dangermond spoke about how organizations are using web GIS to drive efficiency and connectivity like never before. 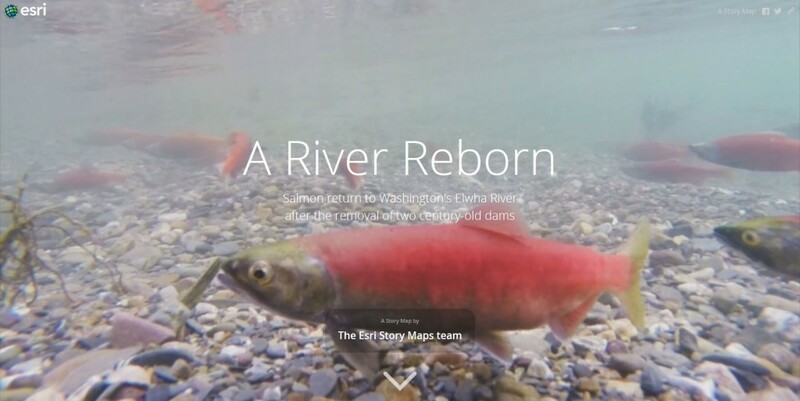 Another trend in web GIS is using story maps to engage and inspire audiences. Organizations, including the White House, combine maps, text, images and videos in story maps to communicate with the public. Esri UC attendees saw a preview of the upcoming Esri Story Map Cascade template. It’s beautiful and easy to configure with cool features like text that slides over background images and built-in animations, layouts, and themes. Anyone in an organization, regardless of how tech savvy they are, can create story maps that provide compelling accounts of national government issues, attractions, and events. As web GIS evolves, maps are getting smarter too. Smart mapping is a new capability in ArcGIS Online and ArcGIS for Server that presents the right tools at the right time when you create maps. This helps all of us who aren’t expert cartographers make stunning maps. The upcoming Esri Story Map Cascade template is beautiful and easy to configure with cool features like text that slides over background images and built-in animations, layouts, and themes. Apps are useful when you need to get the right tools to the right people at the right time. Esri’s ready-to-use apps make it possible for any organization to have a modern GIS and put it into the hands of staff in every department. You just have to find the one that’s right for you. During the Plenary Session on Monday, several Esri staff showed up onstage for a round of App Speed Dating. Each person explained what their app has to offer so you can find the right match. Apps like Navigator for ArcGIS, Collector for ArcGIS, and Operations Dashboard for ArcGIS simplify operations in the office and field. In the world of 3D, ArcGIS Earth is a game changer. It’s a freely available, lightweight app that makes it easy to view 3D maps. It supports KML and is designed to be a familiar experience for people used to working with Google Earth Enterprise. The excitement is building for its release later this year. In addition to the upcoming release of ArcGIS Earth, Esri is working in collaboration with Google on special offers for Google Earth Enterprise and Google Maps Engine customers. ArcGIS currently has enhanced capabilities for creating, viewing, and analyzing 3D scenes on desktops and web browsers. It also simplifies imagery management with on-the-fly processing and dynamic mosaicking. To ease the move, Esri will provide no-cost software to replace the Google products. GIS professionals working for national governments across the world come to the Esri UC each year to see the latest GIS technology, attend technical workshops, and learn from fellow GIS users. The value of hearing how colleagues are finding success and pushing their organizations forward cannot be overstated. A key topic they discussed this year was using GIS to make smarter policy decisions. 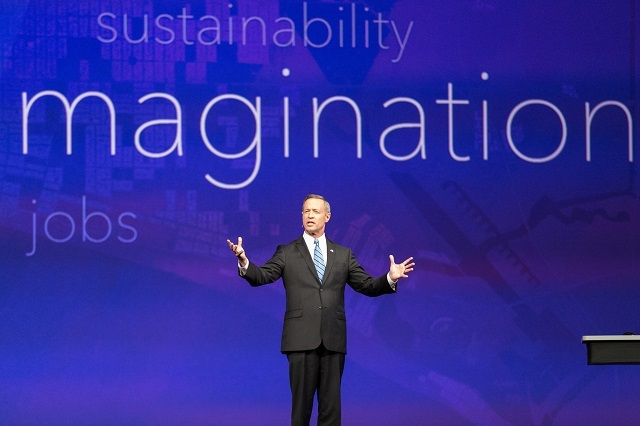 One of the most notable presentations came from former Maryland governor Martin O’Malley, who gave a keynote speech on the value of using GIS to inform decisions that create a more effective and efficient government. Performance-driven government based on GIS analysis was central to O’Malley’s leadership in Maryland as both the state governor and mayor of Baltimore. Former Maryland governor Martin O’Malley spoke on the value of using GIS to inform decisions that create a more effective and efficient government. Policy makers use GIS to take big data and make it easy to understand. Maps show where resources are going and where the need is greatest, where budget decisions will impact people, and so on. Modern governments know that GIS technology provides a foundation for understanding policy impacts, informing policy decisions, and sharing positions on policy with citizens. The trend toward opening data fuels these policy maps. It’s easier than ever for policy makers, citizens, or anyone who wants to have a greater understanding of policy issues to explore relevant data in a map. People understand complex data quickly when it’s presented geographically. And policy makers who understand this use maps to communicate quite effectively with the public. This year’s conference theme was Applying Geography Everywhere. As you are well aware, geography is essential to national government work—from the sciences to defense and intelligence. When we apply geography to problems, we see solutions that would otherwise evade us. As the digital manifestation of geography, GIS provides a rich framework for understanding our world. This understanding will help us find solutions to the immense challenges we face today such as climate change, population growth, and social conflict. Understanding leads to action. GIS provides the platform for actions that build smart nations and a sustainable future. To find out more about what happened at the Esri UC, you can view many of the presentations on Esri’s video channel E380 in the Events section. To get an up-close-and-personal look at all the ways GIS shapes national government, plan to attend the 2016 Esri Federal GIS Conference in Washington, DC, February 24-26. Save the dates for now, and more details will come soon.